The following story is in the 2nd book in The Old Car Nut Book series. After years of being my trusty street rod navigator, parts washer, detail critic, and beer chaser, my wife thought it would be cool to have her own street rod. She was raised on a Nebraska farm and has been driving farm trucks since she was seven years old. Because of that, I was commissioned to build her a street rod farm truck. It was not to be fancy or extravagant, just something cute. We decided it would be a budget truck build. The quest for the perfect truck started. For several months I "shopped" by looking in barns or garages and decided the ideal truck would probably be a pre-war vehicle, say 1936 to 1940. Good ones of those are not easy to find. Just about that time, (2001) Mike DeTracy and his wife Janine both lost their lives in a tragic auto accident while they were on their way to a car show. 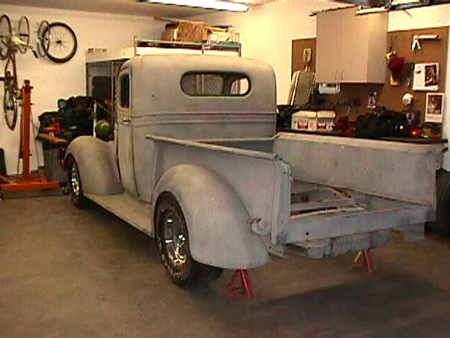 Mike was an avid car guy and had just purchased a 1937 Chevrolet half ton pickup from a farm in Eastern Washington. I negotiated with Mike's brother to purchase the pickup and take over the project. It was not a creampuff by any means, but the budget build was underway. With the body off of the frame and sitting in the corner, I was working on setting up the frame with mustang suspension and "boxing" the frame rails to hold the weight of the new V8 which is way too much motor for that little truck. (There's no such thing as too much horsepower!) My adult son came over to visit and suggested I put air suspension on the truck. I vetoed the idea almost immediately as there is no way I would consider such a major expense for a budget build. That evening during a dinner conversation, my son brought up the air suspension again and my wife heard two words "cushy ride". The air suspension components arrived a couple weeks later. I kept saying to myself "nothing fancy or extravagant, just cute"
A couple months later the frame was done and I was working on the cab getting it ready. The same son suggested we convert the doors to suicide doors, shave the door handles, and set up remote access. Or course I refused to consider that kind of expense for the budget build. That day my son again went over my head and convinced the boss what needed to be done. Converting to suicide doors is a major task and my friend Paul and I spent many evenings creating the support for the hidden hinges and weight of the doors. Also the latches, hinges, and related components are really expensive. I kept saying to myself "nothing fancy or extravagant, just cute"
The bed was another story. With over sixty years of abuse and using the pickup for what it was designed for, the bed simply would not straighten. Buying the panels and possibly a tailgate to rebuild the bed was going to be a necessary expense. But hold on, son decides and convinces mom that we should have a "one off" custom bed designed and manufactured by Hank's Custom Beds. I really put my foot down that time and said there was no way I was going to that expense. Two weeks later I found myself sitting with Hank at his design table in Sacramento, CA. 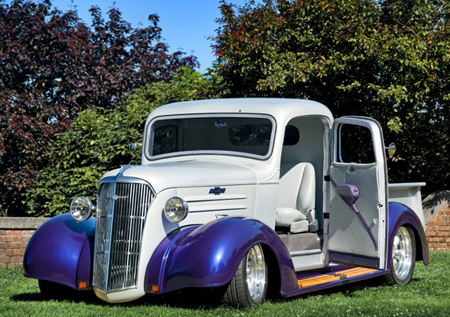 The bed has custom stake pockets, hidden hinges on a shaved tailgate with "secret" opening mechanism, frenched license plate, stainless bed strips, and flush mount tail lights to name a few of its features. It is a beauty and was delivered a few weeks later. I kept saying to myself "nothing fancy or extravagant, just cute"
Now we had gone this far, it only made sense to have some sort of exotic wood for the bed, dash, and running boards. Purple Heart, Teak, Bubinga, and several other varieties of exotic woods were considered. Finally the choice was Appalachian Fiddle Back Maple. These boards had to be shipped from West Virginia, formed, planed, shaped and finished to be perfect. I kept saying to myself "nothing fancy or extravagant, just cute". While attending a car show, my wife saw paint colors she had to have for the truck. It had to be two-tone loaded with pearls, ice pearls, and special components to make it unique. This is the type of paint that provides Christmas bonuses to the employees of the auto paint and supply store. I kept saying to myself "nothing fancy or extravagant, just cute". The upholstery had to be Ultra Leather with a custom design and even the underside of the dash has a custom upholstered panel. I kept saying to myself "nothing fancy or extravagant, just cute". Now the project is completed. The dictionary defines "fancy" as "of superior grade; fine". Sorry honey, it turned out fancy. The dictionary defines "extravagant" as "exceeding reasonable bounds". Sorry honey, it is extravagant. The dictionary defines "budget" as "planned costs and expenses". Sorry honey, I failed there too. The dictionary defines "cute" as "delightfully pretty and precious". I nailed that one. One goal out of four on this project means she is twenty five percent happy with me and my average is going up!